New York: Palgrave MacMillan, 2010, xi, 284 pp. One hundred years ago, a fragile looking young woman disembarked from an ocean liner in Philadelphia to be greeted by her mother and a handful of reporters. During her two years of work for woman suffrage in Great Britain with the Women’s Social and Political Union (WSPU), headed by the controversial Emmeline Pankhurst, Alice Paul had become hot copy in her own country. In the next decade she would become even more so as she led the militant wing of the suffrage movement to victory in 1920. This book chronicles her life through that momentous achievement, with a short Epilogue for the rest of her 92 years. 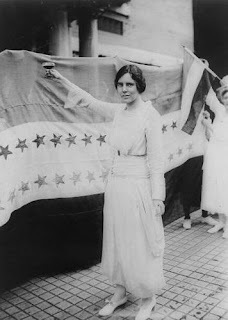 The middle portion of her life was lived in relative obscurity, but before she died on July 9, 1977 she was celebrated widely for the cause she led after she returned to the US in 1910. At that time the US suffrage movement was just beginning to emerge from years of “the doldrums” after gaining equal suffrage for women in four states in the 1890s. A victory in Washington State in November of 1910 brought the number to five. While the National American Woman Suffrage Association (NAWSA) was focused on attaining suffrage state by state, Alice Paul resolved to do it by Constitutional amendment. She also addresses the matter of why the parade had a separate section for black women, a matter that has haunted feminists down to the present day. Turns out that who marched where was much more complicated than the decision of one woman to conform the public procession to the cultural norms of a Southern city, and it wasn’t all that segregated. Paul soon formed her own organization, the Congressional Union, to push for a federal amendment. She started her own newspaper and raised her own funds. She did not consult with NAWSA on any of this, or even report on the activities of its Congressional Committee which she still headed. Not surprisingly, NAWSA’s leadership was not happy at this, and the two groups soon went their separate ways. While Walton’s biography includes much on the organizations Paul headed and the women she worked with, NAWSA is mentioned mostly as an impediment to Paul’s work. One would never know that the women who worked on Carrie Chapman Catt’s winning plan were much of a factor in gaining the 19th Amendment. Woodrow Wilson, however, gets his own chapter. A good deal of Paul’s activity was focused on him, and not on the Members of Congress who had to pass a Constitutional Amendment. Wilson was, as Walton points out, “a complex man.” He preferred the company of women to men, but saw them only as homemakers whose God-given job was to make men comfortable. Although Wilson personally did not believe in woman suffrage, he tried to keep it out of his 1912 campaign. Nonetheless he was willing to meet with suffragists – both NAWSA and Paul’s – many times. In 1914, after seven meetings with suffragists in almost two years, he announced that he would vote “yes” in the New Jersey referendum on suffrage (it lost). This was a major shift in his personal views, but did not mean he was for a federal amendment. Paul was already racheting up the pressure by sending her women to campaign against all Democrats – even those who supported suffrage – in the Western states where women could vote. She borrowed from the British suffragists the idea that it was necessary to hold the party in power responsible for all policy positions, and to punish all candidates who were members of that party regardless of their personal views or votes on suffrage. The 1914 campaign was a trial run for that of 1916, when a new organization – the National Woman’s Party – was formed to inflict on the Democrats the wrath of the women. This campaign, which was much publicized at the time, gets surprisingly little attention in this book. The author devotes considerable pages to the “Silent Sentinels” outside the White House. Under Alice Paul’s command they took up their places in January of 1917 and stayed for over a year. Initially they were ignored by the White House, though certainly not by the press which showered them with disdain and ridicule. Their banners often contained Wilson’s own stirring words about democracy, especially after he asked Congress for a declaration of war on April 2. But in June, they told a visiting Russian delegation that AMERICA IS NOT A DEMOCRACY ... TELL OUR GOVERNMENT THAT IT MUST LIBERATE THE PEOPLE BEFORE IT CAN CLAIM FREE RUSSIA AS AN ALLY. Russia had just recently overthrown the Czar and was in the midst of a revolution. This banner enraged not just the President but the American people, some of whom physically attacked the sentinels and ripped up their banners. Official tolerance of the pickets ended and arrests began. Over the next two years over 500 women were arrested and 168 served time in jail. Some of that time was served in the Occoquan Workhouse, whose superintendent took great pleasure in giving the women a hard time. When they refused to eat the worm-filled food, he had them force fed. The stories they told the press about this experience made them martyrs. A year after the silent sentinels raised their banners and two months after New York joined the growing number of states to enfranchise women, Wilson asked Congress to pass a Constitutional amendment granting women suffrage as a war measure. It still took another eighteen months and a new Congress before the requisite two-thirds of both houses voted to do so. Even then victory was not certain. In fact the 36th State barely ratified it in time for most, but not all, women to vote in the 1920 general election. It was an exciting time. Walton tells this story in a compelling style that lets you live the experience.